We have exported 200, 000 tons steel structure to overseas market. The load bearing parts for steel structure workshop are mainly steel structures, including steel columns, steel beams, steel structural basements, bracing systems for wall and roof. Steel workshops are divided into light steel workshops and heavy steel workshops. Steel structure workshop is a new type of light steel structure building system formed from a main steel framework comprised of H section, Z section and U section steel components, the roof and walls utilizing a variety of panels and other components such as windows, doors, and cranes. They are the most common steel materials used for steel structure in China. 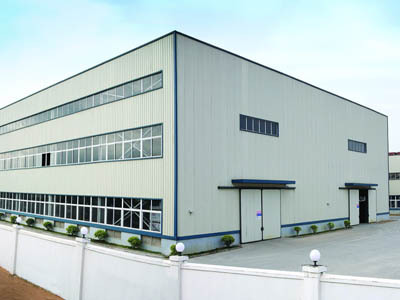 The steel structure building is widely used in the construction of buildings such as warehouses, workshops, and large factories. 1) Large span for great strength with light deadweight. 2) Short finishing time and low cost, manufacture with high quality control. 3) Fire proof and rust proof, convenient to assemble or disassemble. 4) Main materials: H beam/C purlin /Z purlin /sandwich panel/ corrugated steel sheet. 5) Design according to customer's requirement, nice appearance, easy to maintenance.